Called when the channel is connected. It returns True if the corresponding connection is to be allowed. Else it returns False. True if the corresponding connection is allowed, else False. Called when the channel has the CONNECTED status and the channel was refused by a previous call to accept(). This method enables your implementation to send a message back to the client before closing or whatever you need. 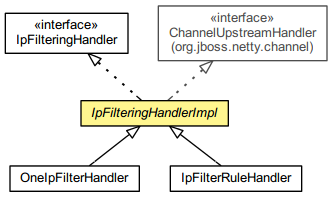 This method returns a ChannelFuture on which the implementation will wait uninterruptibly before closing the channel. For instance, If a message is sent back, the corresponding ChannelFuture has to be returned. the associated ChannelFuture to be waited for before closing the channel. Null is allowed. Internal method to test if the current channel is blocked. Should not be overridden. If one wants to not block events, just overridden this method by returning always true. Note that OPENED and BOUND events are still passed to the next entry in the pipeline since those events come out before the CONNECTED event and so the possibility to filter the connection.